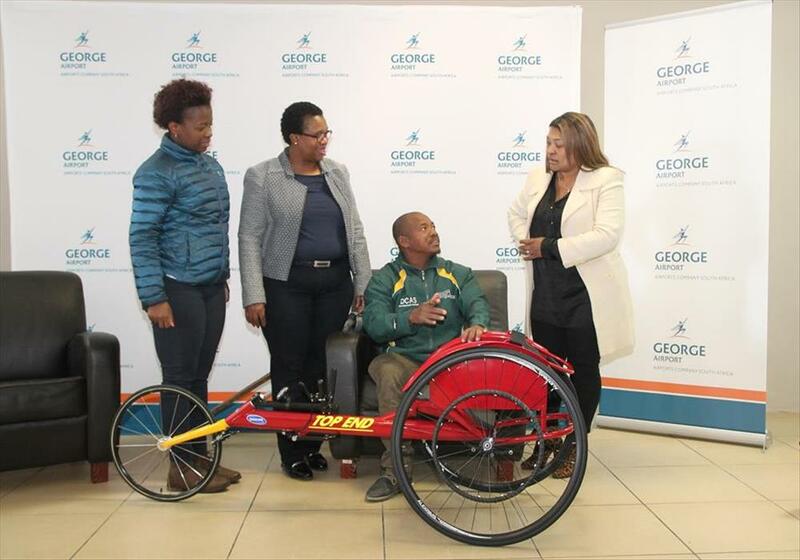 Adele Nkomo (left) and Senzeni Ndebele ACSA spokespersons, Gerrit Hendricks and Brenda Vorster, manager George Airport discuss the advantages of the new racing wheelchair. Photos: Myron Rabinowitz. GARDEN ROUTE NEWSFLASH - The future of next year’s 16th Outeniqua Wheelchair Challenge (OCC) is secure. Senzeni Ndbele, ACSA Corporate Affairs manager for regional airports, announced this at a press conference on Friday 25 August. "George Airport will increase its sponsorship for the OCC in 2018, its flagship social responsibility program. Last year the sponsorship figure was R750 000, we haven't finalised the final amount for 2018 yet." Oudtshoorn’s Gerrit Hendricks, a wheelchair athlete who has been sponsored by the George Airport for the last 6 years, received his new R74 000 lightweight aluminium racing chair. Brenda Vorster, George airport manager told Hendricks: "Now you have the chair, you must challenge your friend Ernest van Dyk and win next year’s OCC.